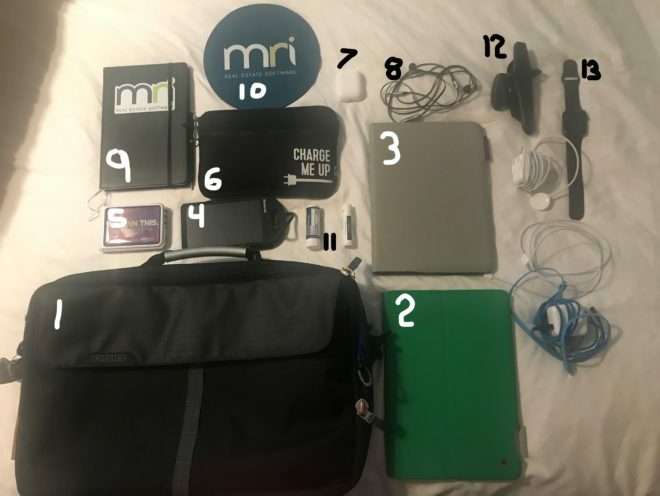 Matt Mullenweg the CEO of Automattic…which operates WordPress, which is who I use to run this blog, has a yearly post of what is in his bag. Matt’s Post In his post, he lists all of the things that he carries with him. I am going to shamelessly copy his idea and give you a post of all the things I carry with me when I travel. Briefcase #1 – I recently changed bags. I now carry the OGIO bag pictured below. I used to use a Johnston Murphy leather bag. I had this bag for over 5 years and I loved it but the bag’s clasp broke and I needed a new bag. I like the OGIO bag because it is small enough to place under the seat in front of me on a plane and I can stretch my feet over it but it has enough room to carry all of my stuff. Computer – Lenovo– From my current employer. I don’t have a choice in this one but this one works fine and I do not have any complaints about the computer. Two iPads #2 & #3 – One is mine and one is the companies. I will post another day about what apps I have on my phone and my tablets. Powerbanks – Nekteck Solar Powered Powerbank #4 (Purchase here on Amazon). I also carry an OrigAudio #5 one that my company gave me during a sales kickoff. Cord Carrier #6 – My Mother In Law gave me this for Christmas and it is a good bag to keep your cords in. Notebook #9– This was given to me by my employer as well. I am not picky about which notebook I use, I just need one that I can write on. Here is the planner I am using now. Mousepad # 10– Nothing fancy here but I always want one in case my meeting is in a room with a marble table top. Most laser pointed mice do not work on marble. #11 I always have to have a tube of ChapStick and some Advil to defeat a potential migraine. # 13 I have an Apple Watch on my wrist. Plus I always have extra cords laying around. I hate to see any of my devices getting into the red levels on the battery gauge.